Ready for More Business from Facebook? Then relax, sit back and follow along as we show you how incredibly easy Setting Up Your Business on Facebook really is. Setting up your business on Facebook is incredibly easy. Follow along as we show you exactly how to complete the process. Ready? Good! Create a personal profile if you do not already have one, or login to Facebook. Even if you do not want to have a personal profile, we strongly recommend doing so because of the business-only limitations you will run into. Choose a business category for your page. Choose an Industry Specific Category. Choose a category that matches your business. Agree to the Facebook terms and click “Get Started”! For the sake of brevity, we have simplified the steps to the most basic description. If you are looking for a little more help with setting up your business on Facebook, take advantage of our Ditch the Daycare e-course HERE. For your business page to be considered serious, you should have 100 likes. That is why setting up your business on Facebook is going to require just a bit of marketing. Don’t worry though, it is not scary at all and you certainly don’t need a business degree! How do you get your first 50 likes? First, leverage your current network (therefore having a few close friends and family like your page) doesn’t hurt, but you do want people who are a good fit for your business. Keep in mind only asking those people who would genuinely care about your products. Go to the “Invite Your Friends to Like This Page” and click “invite” on all relevant Facebook Friends. This will send them a notification that you are requesting for them to Like your page. If you have an existing email list, send them an email directly with a link to your Facebook Page and ask them to click the “Like” button. Make sure you tell them why they should “Like” your page and give them an incentive for doing so. 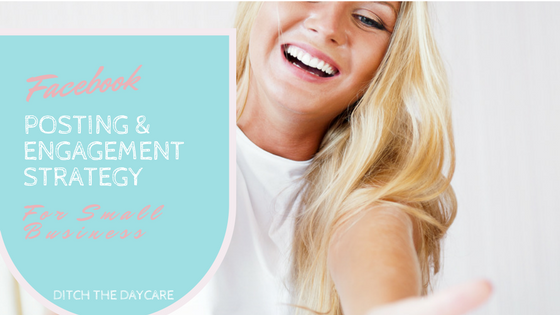 If you are looking for a little more help with setting up your business on Facebook, take advantage of our Ditch the Daycare e-course HERE. As you are Setting up your business on Facebook, you are going to have to get organized. The first thing, as we have taught to Mompreneurs across the country, is that you have defined target customer. Are they hanging out on Facebook? Would the person you are able to help with your product or service be there? If the answer is yes, let’s move on. In general, you are looking for nice, visually appealing, ENGAGING content to share. When running your business on Facebook you will be looking for high engagement, to ultimately drive more eyes and “likes” on your page. Anne & Meredith, Founders of Ditch the Daycare, have worked with business owners just like you in almost every country around the world. If you want to make more profit in your business, starting today, you simply cannot ignore proper Facebook marketing any longer and lucky for you, setting up your business on Facebook has never been easier.